This content element gives you the opportunity to offer downloadable files to the visitors of your website. When combining both methods, single files and file collections, all files from these methods will be presented to the website visitor. 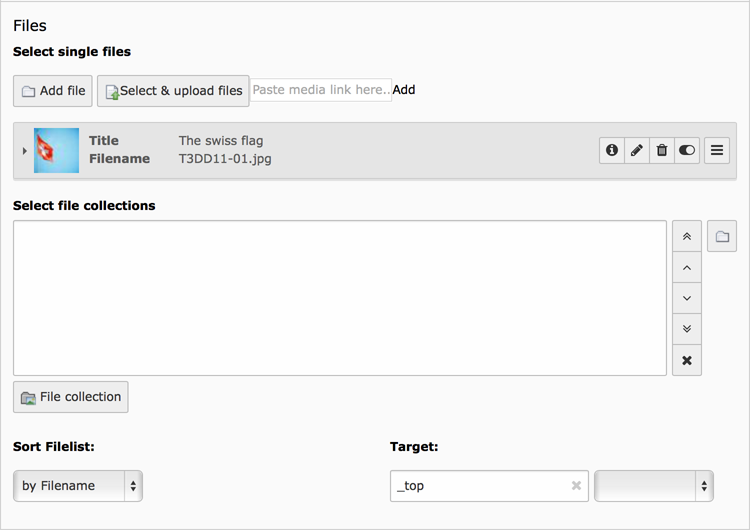 In this dropdown you can select if you only want to show the file name, the file name and a corresponding icon, based on the file extension, or the file name with a thumbnail, if it is possible for TYPO3 CMS to generate a thumbnail from the file. Will show the file size calculated from the amount of bytes and presented as a human readable string with the proper unit (B, KB, MB ...). Will display the description of each file, if available.